Unless someone discovers the fountain of youth in the next few decades, almost everyone alive right now won't see another Venus transit after today's. That's why everyone is watching it, from astronaut Don Pettit at the International Space Station's cupola to every telescope on Earth to a navy of space vessels in orbit. And you should too. 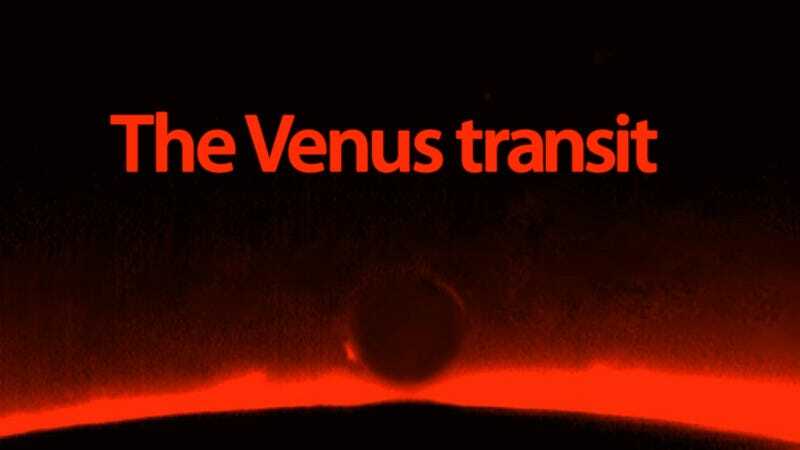 The transit of Venus is one of the rarest astronomical events in our solar system: our sister planet will fly just in front of the Sun at the right time for all of us to watch it from Earth. This event happens in pairs, every century. The first of this century's pair happened in 2004. The next one is about to happen today. After this, the next transit will happen in 2117. Venus is now en route, and getting really close. It will last almost seven hours. You will be able to watch the entire show from the western Pacific, eastern Asia and eastern Australia. The rest of Earth will have to settle for obstructed views. • Whatever you do, DO NOT LOOK DIRECTLY INTO THE SUN WITHOUT PROTECTION. Staring at the Sun can damage your eyes permanently. • DO NOT use your sunglasses as protection. While sunglasses can protect your eyes under normal use, they will not protect your eyes while staring directly at the Sun. • Even if you have adequate protection, don't look at the Sun for a long time, so remember to stop looking from time to time. • The best protection is wearing welding goggles with No. 14 glass. • The next best is buying an eclipse filter. They are inexpensive, but they are good enough to protect you. Make sure they are the good stuff, and not just dark plastic. You can see some brands and models here. • Use a telescope or binoculars. Again, these MUST have the proper filter. Most brands come with eclipse filters, so you will be safe. But if you have any of these, you probably know what you are doing anyway. • Use a pinhole projector. This will allow you to look at the Sun projected on a piece of paper, so it's perfectly safe. You will see the Venus shadow travelling on the paper. You can make these yourself following the instructions here. • Use a reflected pinhole projector. This is pretty awesome, as it will create a big image of the Sun on any wall. Use the instructions here. It's also perfectly safe. • NASA's Transit of Venus, transmitting live from Mauna Kea, Hawaii. • SkyCenter at Mt. Lemmon. • Slooh SpaceCamera (they are live right now). • The Mead Observatory will have the transit captured live in several wavelengths. • NASA's Astronomy Picture of the Day is also updating live.